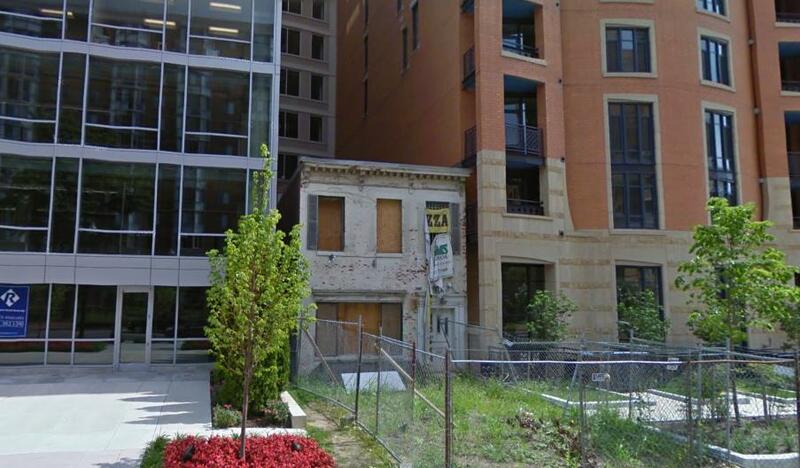 Austin L. Spriggs declined repeatedly to sell his aging row house on Massachusetts Ave. in northwest Washington, DC to developers whom later realized they could go ahead and build without his property. Spriggs ultimately held on to the small building and even occupied it for a time as it clung to the edge of a four story construction crater. An office building and 1700-unit condominium now adjoin his building on three sides and tower above it. Photo courtesy of the Washington Post. The right not to have one’s property taken for purposes other than “public use” is one of the most basic rights afforded to American citizens in the US Constitution. 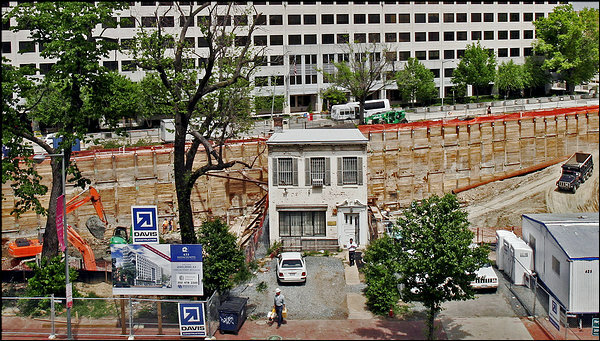 Eminent domain helped build the public infrastructure that moves and powers the country. Accordingly, eminent domain was not thought of as a tool to convey land from one private party to another. But over the last 100 years, the courts have stretched and broadened definitions of “public use.” In so doing, they have tested the American public’s tolerance for eminent domain as they began to interpret the term “pubic use” more and more broadly as “public purpose”. Eminent domain is now not only used for roads, railroads, and power lines, but also in instances where economic development is the impetus and the lines between public and private use are blurred. The trend is controversial. A decision last week out of New York’s highest court had brought eminent domain to the forefront of public discourse. The court upheld the use of eminent domain to seize private property on behalf a developer who plans to build a $4.9 billion project called the Atlantic Yards in Brooklyn. The 22 acre project site encompasses an old rail yard, a blighted neighborhood, and another neighborhood whose “blightedness” is questionable. Plans call for 16 high rise buildings and an NBA stadium for the New Jersey Nets. In the 20th Century, judges generally agreed that in projects like sports stadiums or private railways, the benefits of eminent domain accruing to certain individuals should be considered a by-product of the new quasi-public amenities that they bring to cities. The Supreme Court also upheld the use of eminent domain to enhance “blighted properties.”It was not till the Supreme Court’s controversial 2005 Kelo decision that the issue of the legitimate use of eminent domain became a full-fledged public firestorm. In that case, the court allowed a Connecticut development corporation to forcibly purchase property from 15 uncooperative landowners as part of a private economic development venture. The project was designed to create jobs and increase the local tax base. The area was not considered “blighted” but “economically distressed” and the court held that since the eminent domain was part of a comprehensive redevelopment plan, it should go forward. In the Kelo decision, the Supreme Court deferred to the local officials as to whether revitalization of a relatively stable neighborhood was warranted. They supported the use of eminent domain in New London, Connecticut because of the comprehensiveness of the development plan. The issue before the New York court was not whether redevelopment was worthwhile or comprehensive enough, only whether the state’s erred in its assessment of the area as fitting the legal definition of “blighted.” Again the courts decided to deffer to local officials and not intervene. The case and its legal intricacies notwithstanding, there are serious questions as to the desirability of this type of redevelopment. Indeed, the second half of the 20th century is ripe with instances of the gross misuse of eminent domain for “slum clearance.” The burden of these actions fell disproportionately on America’s poor and minority communities. Now the idea is being reincarnated in communities that could scarcely be labeled as blighted by most standards. Most urban planners agree that modern superblocks are a failure of urbanism that destroys the historical character and vitality of many American cities. Jane Jacobs, an influential urban observer, decried the deadening effects that “cataclysmic money” and massive redevelopment schemes brought to previously vibrant streets. Still, it’s hard to deny that comprehensive redevelopment plans if done correctly can and do sometimes bestow meaningful benefits to cities and communities. Many have a hard time feeling sorry for the inevitable homestead holdouts that try to stand in the way of some projects. There are always those predictable stories of the 90 year old that has lived in the house for their whole life, but oftentimes holdouts are simply trying to extort as much money as possible. Property rights defenders should recognize that there is a fine line to be walked between reasonableness and outright obstructionism. Many local governments have shown great restraint in using eminent domain for redevelopment and initiate elaborate procedural processes to ensure project transparency and public participation. If despite all their best efforts, a local government cannot get the voluntary sale of a property essential to a redevelopment plan, they should have the right to initiate (or threaten to initiate) eminent domain proceedings in the most extreme cases. One of the most basic rights afforded to American citizens is a right to not have their property forcibly taken… even in instances where they are given fair compensation. Yet constitutional interpretations changed with the time to adapt to the modern world. As such, the rights of a property owner have changed substantially since the framers crafted the 5th amendment in 18th century agrarian America. Just as the Supreme Court found mining and irrigation ditches reason enough to reinterpret the meaning of “public use” during heyday of westward expansion for the sake of economic advancement, so to are courts reinterpreting its meaning to provide jurisdictions the tools they need to maintain their economic competitiveness in this global, urbanized, knowledge-based economy. In any redevelopment project, some implicitly assume that the whole will be greater than the sum of its parts and that the final product will catalyze even further growth in the area. History has proven that the results of these types of projects are decidedly mixed. Incidentally, the economic development proponents from the 2005 Kelo case announced last week that they were pulling out of the Connecticut project all together due economic conditions. The vacant New London lots are a testament to the speculative nature of high stakes, publicly-subsidized projects that are so often a part of eminent domain proceedings with economic development goals. Cataclysmic investment in the form of stadium and superblock projects created the kind of economically sterile, dead and dull urban places that Jane Jacobs so abhorred. Perhaps, in the wake of last week’s New York ruling, we’ll see more state-level laws to curb the use of eminent domain. If not, the era of masterplanned economic redevelopment projects will continue. The results, I think, will be just as mixed as they were in the past.